Versatile fried chicken is both a homemade comfort food and a familiar offering at fast-food restaurants. You can eat it as a main course or have it in sandwiches or salads. Fried chicken breasts may have some nutritional advantages over fried dark-meat chicken or fatty hamburgers, but too much fried chicken, no matter what kind it is, isn't good for you. It's best to either grill the chicken breasts or eat the fried chicken in moderation. The exact nutrient content of your fried chicken depends on specific factors, such as the serving size, whether you eat the skin and any additional ingredients in the recipe. A fried, skinless chicken breast half weighing 86 g, or 3 oz., has 161 calories. A serving of breaded and fried chicken breast with the skin has 218 calories. Nearly half of the calories are from added fats and starches. A fried chicken breast without the skin provides 29 g of protein and less than 1 g of carbohydrates. It has 4 g of total fat and 1 g of saturated fat. A fried and breaded chicken breast with skin has 21 g of protein, 8 g of carbohydrates, 11 g of fat and 3 g of saturated fat. Fried chicken breasts may contain trans fats, which can be formed during the frying. Trans fats are the least healthy type of fat, because they raise your LDL cholesterol and lower levels of healthy HDL cholesterol in your blood. 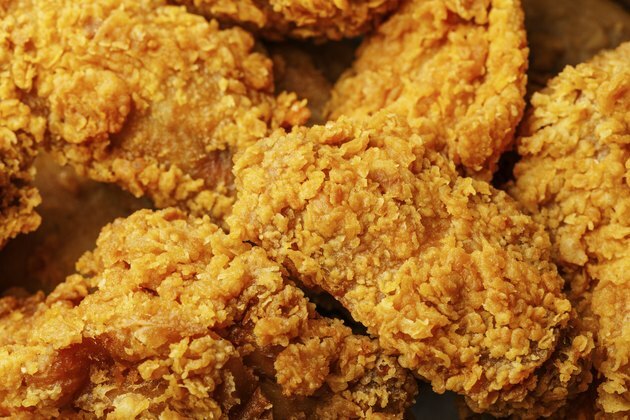 A fried chicken breast without the skin has 78 mg of cholesterol, and a fried and breaded breast with the skin has 71 mg. Cholesterol from your diet raises levels of unhealthy LDL cholesterol in your blood and may increase your risk of developing heart disease. The recommended daily limit for healthy adults is 300 mg of cholesterol per day, according to the U.S. Department of Agriculture's 2010 Dietary Guidelines. Cholesterol is in fatty animal foods, such as meat, full-fat cheese and butter. Fried chicken breast without breading or skin provides 13 mg of niacin, or 65 percent of the daily value per serving. It has 68 mg of sodium and 237 mg of potassium. Breading would add to the sodium content. A high-sodium, low-potassium diet can cause high blood pressure and increase your risk of developing heart disease, kidney disease and stroke. The chicken has 1 mg of iron, or 6 percent of the daily value, and 22.5 mcg of selenium, or 32 percent of the daily value. Is a Turkey Sandwich Healthy?